This girly pink and purple children's watch from Timex Kidz is the perfect first watch for any little girl. 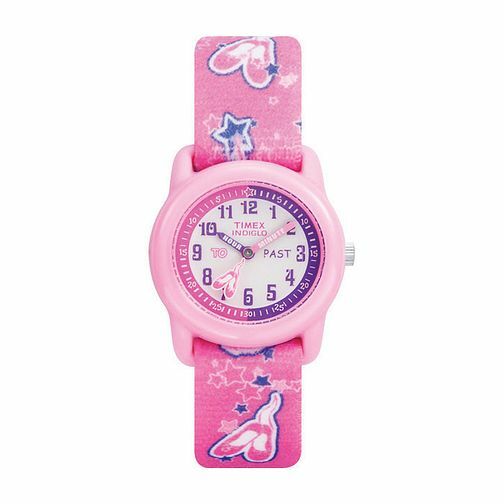 Featuring a pink plastic case with a fabric ballet and starry print strap, this fun kids' watch is both cute and comfortable. Timex Kidz Girl's Tutu Ballerina Fabric Strap Watch is rated 4.0 out of 5 by 3. Rated 5 out of 5 by Anonymous from Great 1st watch Bought for my 3yr old daughter. It has stretchy fabric strap that can be adjusted all the way round so is perfect for her tiny wrist. Rated 5 out of 5 by Anonymous from Excellent children’s watch Bought this for my twin girls and child’s 4th birthday, what a brilliant good quality child’s life arch perfect for any child wanting to learn time. Would highly recommend it.